The art of making natural dyes is one of the oldest known to humankind. While the very earliest dyes were discovered by accident using berries & fruits, with experimentation & gradual development the vegetable dyes have developed into a highly refined art. 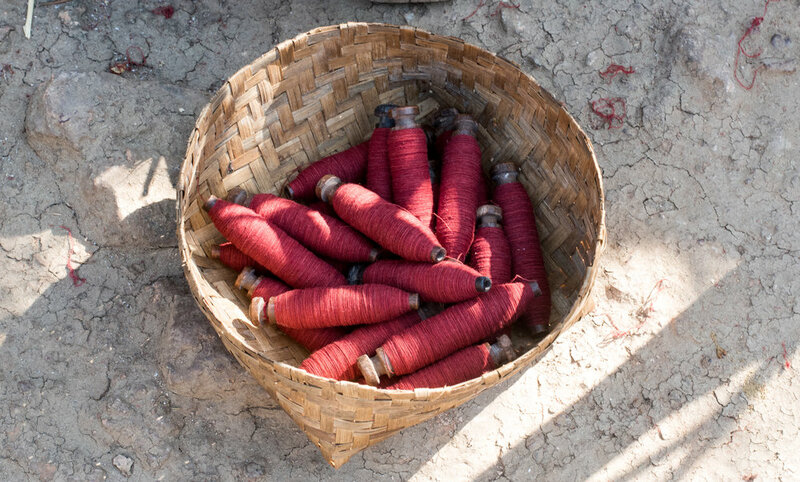 India’s expertise in natural & vegetable dyes dates back to ancient times. One such centuries-old dye ‘recipe’, is that of the indigenous populations of Koraput in Odisha. 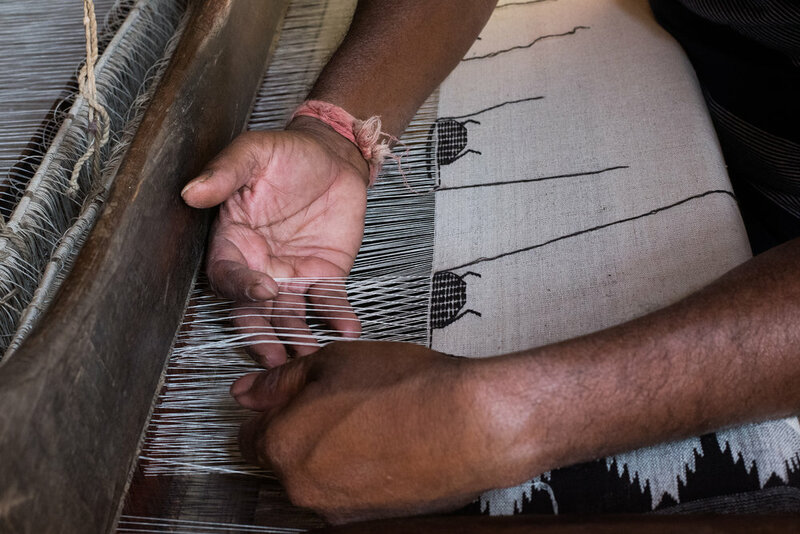 Today, families of the ‘Mirgan’ community in Kotpad, Koraput weave the naturally rough textured cotton cloth & also create the unique natural dye, whose ravishing redness & ‘fastness’ is legendary. They are followers of Kabir Das, a 15th century Indian mystic poet & saint, who also earned his living at the loom. His poems are famously called ‘Kabir Ke Dohe’ in hindi & he was the first Indian saint to bring together Hinduism and Islamism by recognising a universal path which could be followed by all. The stunning red dye is extracted from the roots of the Indian Madder (Aal or Rubia cordifolia) tree. The powerful & vibrant shades range from deep maroon to dark brown depending on the proportion of dye used & the addition of sulphate of iron. The use of castor oil makes the cloth soft & the colours lustrous & fast. Only the women of the community handle the dyeing process. First, the Aal powder is boiled in vats for hours along with bundles of natural white cotton yarn treated with castor oil. 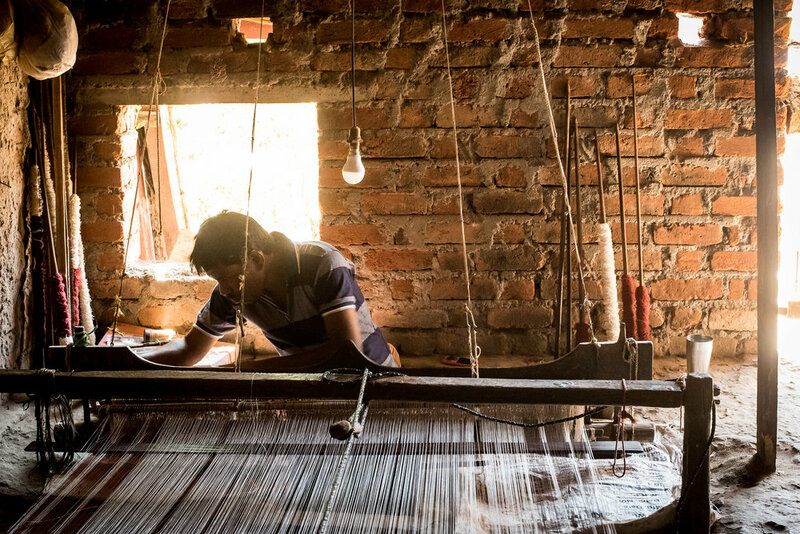 This yarn is then hung from bamboo frames, allowing it to dry (as seen in the pictures above). Women wash the treated & dyed yarn slapping it on rocks, kneading it over and over with their hands & feet at the village pond. Shikakai (Acacia Concinna) & Reetha (Sapindus Mukorossi) are used for the first wash, which is a soft wash to make the colour permanent and strong. About a month of labour results in the threads' metamorphosis from the original cream shade to dramatic reds, maroons, rusty pinks, coffee browns & deep blacks. This limited, but deep and mysterious colour range is offset by the natural unbleached off white of the major portion of the fabric, with motifs drawn from nature & their way of life, producing astonishing results. The dyed threads are then handed over to Kotpad's male weavers, who transform the threads into beautiful stories that one can wear. The dyed coarse cotton yarn, ranging from ten to twenty counts is woven in a simple but highly evolved three-shuttle pit loom with extra weft patterning for the more complicated motifs. Solid border effect of the fabric is made with the interlocking method of the multi shuttle loom. The designs used have an underlying symbolism & are largely inspired by nature. The motifs that each authentic Kotpad weave embodies, religiously maintains the traditional indigenous art which visually represent their way of life. They typically include depictions of traditional patterns, tools, professions, native animals, huts, etc. These motifs have been passed down from generation to generation. The textiles of Kotpad speak of ancient traditions & a symbiotic relationship with nature. Wearing this weave invigorates a sense of rustic authenticity & means that you wear a tradition that was intimately created for oneself, humbly concealed amidst tribal life. To view our range of Kotpad textiles, check out our 'collection' section. We have everything from minimal beauties to intricate motifs.